The Weight of Our Sky is phenomenal. It is one of those books which shake you to your very core. Wringing every tear, happiness, and emotion from your body, The Weight of Our Sky is not to be missed. I could write a laundry list of all the things I loved about The Weight of Our Sky. From the characters that tugged at my heart strings, to the visceral and moving history, all the way to the content warnings and author’s note at the beginning. Each word, each element, is written and regarded with such tender care. If you love compelling and gripping books, historical fiction, or diverse characters, you have to have The Weight of Our Sky on your list. 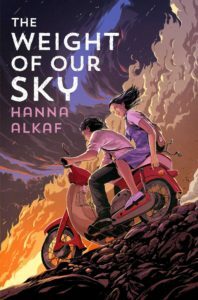 Alkaf begins The Weight of Our Sky with a personal and moving letter about the implications and personal connections to the history within. It’s a testament to the power of books touching lives, and having the ability to transport a reader both in time and space. Alkaf is also upfront about the trigger warnings of graphic violence, death, racism, OCD, and anxiety. In the new wave of books with explicit content warnings, Alkaf’s letter goes a step further. It addresses the reader directly about picking this book up, about protecting your heart, and the appreciation to further readers. Through this letter Alkaf tells us about some of the history touched upon in the book, giving the book, before it even begins, a grounded feeling.We can tell the words we are about to read are going to shake our very bones. Move our heartbeat. And touch fragments of our heart. Alkaf acknowledges the power of books, of memories, and stories. Because when the voices of those with these lived experiences begin, it’s our duty to take up the torch. To keep these injustices, deaths, and lives alive in our memories. Additionally Alkaf talks about the mental health lack of knowledge, about its ability to be linked to a djinn when there was not enough science on OCD. I know more books are including trigger warnings, but I wanted to talk about Alkaf’s and the way the personal letter goes a step further. Melati immediately makes space in your heart. Whether it be her love for her friend, her feelings of powerlessness, or her determination. Alkaf lets us into her mind, into her heart. We hear the thoughts within her head. Of the nightmares, the fears, and the vulnerabilities. The Weight of Our Sky brings us closer to this dangerous moment in history. And from the beginning Melati captivates us. With her bravery, her strength, and her love of music. While I can’t speak to the OCD representation in this book, Melati’s story brings us the closest I’ve ever been to OCD. As her memories are exposed to us, we can see the evolution of her OCD. The fear in her mother’s eyes. The hurt Melati hides every day. Almost immediately I wanted to protect Melati with every fiber of my being. I could feel my own heart fracture, imagining the daily struggle Melati goes through. The struggles to mask the thoughts in her head, to know only temporary relief, and without anyone to confide. And within this rich world, with this character who pulls at our heart, is a moment of dynamite. A night of terror, death, and destruction. That exists within a larger powder keg. There’s fierce and dangerous tension between the Chinese and Malay people. Arguments born of ignorance, of fear, of anger. And while this is grounded in an event from the past, it remains present how similar some of these sentiments are to today. It’s the problems of Us versus Them. How we confront them at our dinner table. And the need to see beyond the external, to the people underneath. A desperate need for solidarity before we are torn apart from the inside. Melati really grows up in the span of this book. Not only with suffering and loss, but also having to look at her own life. Her own opinions. While she struggles to un-piece this situation of years of simmering anger and resentment. But while she never asked for any of this, it is also her responsibility. And that’s where this amazing title comes into play, the weight of our sky. There’s a saying that means “where you plant your feet is where you hold up the sky” (mentioned within the book, I can’t quote a page number from the advanced copy). The character talks about the importance of assimilating into society, but also about the shared responsibility of home. The way we take on its burden, it’s complexities, and the ability to change our land. To change our opinions, to lift each other up instead of tearing down. The Weight of Our Sky is a book you can feel underneath your fingertips. From the smoke, to the guns, to the sweat, you are immersed. Melati has to grow up fast. She has been forced to take more than her share of responsibility. Hiding her OCD from her mother, her friends, and suffering alone and silently. And Melati has to figure out what is the right course of action, how we fight the hate, and become the best versions of ourselves? Because at the end of the day, Melati just wants to find her mother, her best friend, but she becomes drawn into a conflict bigger than that. The Weight of Our Sky is an emotional and moving read about a girl’s journey for family and her realization of her own power. I wasn’t 100% sure I was going to pick this book up but you has definitely convinced me. I can’t wait to read it now! !